As we've reported, Sotheby's is auctioning the Evill/Frost collection this week, which has been described as the "greatest collection of 20th Century British Art ever to auction". The pieces were collected by Wilfred Evill between 1925 and 1960. They have been largely kept out of the public eye since a memorial exhibition for the late Evill at Brighton City Art Gallery in 1965. Right from the start, bidders have been itching to battle over the works, which include Lucian Freud, Stanley Spencer, Patrick Heron and Henry Moore. The first day has already seen prices bursting past estimates right, left and centre, with Freud taking the early plaudits: Boy on a Sofa, his early portrait of child burglar Billy Lumley who Freud painted after Lumley tried to break into his house, has set a world record price for the artist. Created in 1944, the work was bought that same year for £18. But yesterday it sold for just under £1.5m ($2.4m), trouncing its £400,000-600,000 estimate. What a fantastic investment that proved to be. 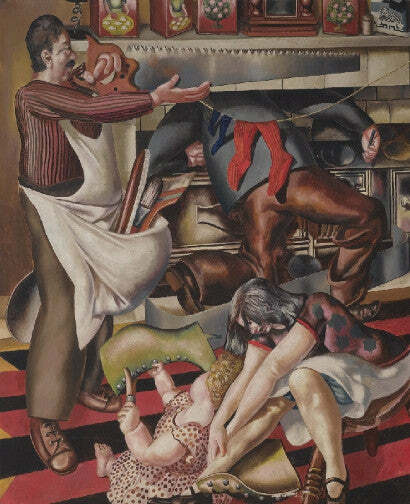 This was by no means the top lot of the day, however, as Stanley Spencer's works provoked frenzied bidding, with his Workmen in the House easily surpassing its £1.5m-2.5m listing to achieve £4,745,250 (over $7.7m). His The Bathing Pool, Dogs provided an even more remarkable performance as the £800,000-1,200,000 listed work almost matched its more hyped relation, achieving £4,185,250. The second part of the sale is just getting underway now and features two more works by Spencer: Hilda with Bluebells and Portrait of Hilda expected to hit up to £600,000 between them. Watch this space for more results from this extraordinary sale.